The concept of evil spiders perhaps originates in Old English – a language with which Tolkien was intimately familiar from a lifetime of research. The Old English term for spider was attercoppe, which is derived from atter meaning “poison” and coppe meaning “head”. Interestingly, even after Old English faded out of use, the term attercoppe was retained for many years as meaning a peevish or ill-natured person. Tolkien used “attercop” as well as “cob” and “lob” in The Hobbit, where Bilbo Baggins sings songs taunting the giant spiders in Mirkwood: “Attercop, Attercop, Old Tomnoddy” and “Lazy Lob and Crazy Cob”. These phrases recur in the name of Shelob, the “last child of Ungoliant to trouble the unhappy world” in The Lord of the Rings. As Tolkien admitted in a letter to his son, Shelob “is of course only ‘she + lob’,” – lob being an archaic English word for spider, influenced by Old English loppe or “spider”. Another possible influence for the evil spiders of Middle Earth is the author M R James, whose stories Tolkien may have read and admired as a child. James was a generation older than Tolkien but the two had similar academic and antiquarian backgrounds. James was also a brilliant ghost story writer – he could even be described as the father of the supernatural genre in much the same way that Tolkien is often described as the inspiration for the modern fantasy genre – and he had a near-pathological fear of spiders that sometimes permeated his stories. In The Ash-Tree for example, the grisly find of the skeletal remains of a witch is described as being accompanied by her arachnid familiars creeping out of the eponymous tree. The story’s narrator describes seeing the “remains of an enormous spider, veinous and seared! And, as the fire burned lower down, more terrible bodies like this began to break out from the trunk, and it was seen that these were covered with greyish hair”. If that doesn’t induce a shudder, I don’t know what will! It has to be said, however, that in many ways Tolkien and James deviated from the usual cultural depiction of spiders, which has been largely positive through the ages. In the ancient world the spider symbolized patience and persistence due to its hunting technique of setting webs and waiting for its prey to become ensnared. In Ancient Egypt, the spider was associated with the goddess Neith in her aspect as spinner and weaver of destiny, this link continuing later through the Babylonian Ishtar and the Greek Athena. In African mythology, the spider is personified as a creation deity Anansi, and as a trickster character in African traditional folklore. Indigenous North American cultures have also traditionally depicted spiders. The Native American Lakota people’s oral tradition, for example, includes a spider-trickster figure, which is known by several names, among them Unktomi. The South American Moche people of ancient Peru, who worshipped nature and placed emphasis on animals, often depicted spiders in their art. For King Robert the Bruce of Scotland, the spider was as an inspirational symbol, according to an early 14th century legend. 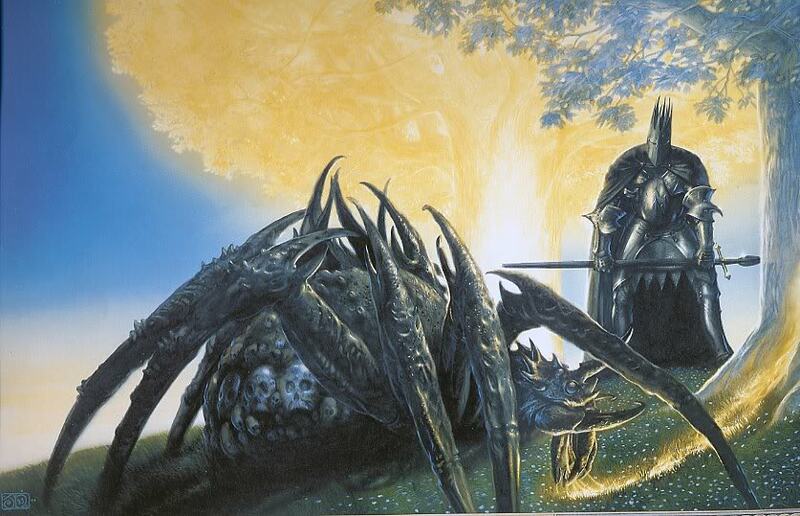 In Middle Earth, however, the spawn of Ungoliant were seen as wholly evil. In The Hobbit, for example, the Mirkwood spiders are described as being the only race upon whom the Wood Elves have no mercy – perhaps because of the ancient wrong done to the Trees of the Valar by their foul progenitor. In the Third Age they came into Greenwood the Great and made this forest so dark with their webs that it was re-named Mirkwood. Though the Mirkwood spiders were but small in form compared with their dreadful ancestor, they were large in number and wise in their evil craft of entrapment. They spoke both Black Speech and the common tongue of men, but in the Orc-fashion, full of evil words and slurring rage. As for Shelob, vast and strong as she was, she met her end at the unexpected hand of the hobbit Samwise Gamgree, perhaps the least of all her prey. After the mortal wounding of Shelob, Mordor and Dol Guldur were destroyed and the Mirkwood spiders also perished, leaving the world no longer troubled by the spawn of Ungoliant.